Albany, N.Y. – You’re invited to an evening for traditional dance, fun and live music, Tuesday, September 19 and Tuesday, October 3 at the historic Shaker Meeting House. Callers will be Joan Savitt (September) and Fern Bradley (October), with music provided by the Capital District MegaBand, conducted by George Wilson. 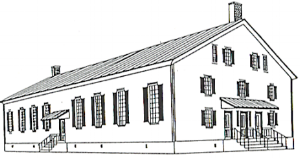 The program will be held in the Shaker Meeting House, which has been used as a site for community, celebrations, and dancing since 1848. The Shaker Heritage Society is located near Albany Airport on Heritage Lane on the grounds of the former Ann Lee Nursing Home. This event is co-sponsored by The DanceFlurry Organization and the Shaker Heritage Society. Pre-Registration is not required. Admission is $6 students; $10 SHS and DFO Members and Seniors; $12 non-members. Call or e-mail Michelle at (518) 456-7890, x3 or ShakerEducator@gmail.com for more information.